A Victorian matchmaker becomes the target of a macabre stalker and turns to a reclusive mystery writer for help—and when the danger escalates, so does their relationship. After inheriting a grand home but little income, Calista Langley launches her own introductions business, offering clients “an opportunity to meet like-minded people and perhaps develop friendships.” When popular mystery author Trent Hastings confronts her, worried that she’s taking advantage of his sister, the two get off to a rocky start, but Calista holds her own, and he finds himself attracted to the innovative business owner. When they meet again, he learns she's been receiving creepy presents from an unknown giver—memento mori items suitable for people in deepest mourning but containing her initials—and volunteers to help her get to the bottom of the disconcerting pranks. Except as they delve into the puzzle, they realize the sender has left a trail of previous recipients, each of whom has wound up dead. The stakes get higher as their investigation suggests Calista is in the sights of a serial killer, with signs pointing to an ex-suitor. Finding proof is elusive, however, while the physical dangers escalate and potential witnesses keep winding up murdered. Meanwhile, Calista and Trent, two bruised souls who expected to live solitary lives, find affinity and passion in each other, and as they open up to hope and love, other familial and friendship bonds are tightened. The couple’s chance for happiness seems quite good, if they can wrap up the mystery before it kills them. Romantic suspense luminary Quick (aka Jayne Ann Krentz) moves into edgy thriller territory with intelligence and aplomb and uses the backdrop of gaslight-tinted, death-obsessed Victorian London to perfection. The plot is smart and tight and the characters complex, while the subtle wink of humor toward a successful mystery author’s plight and romance subplots will make fans smile. 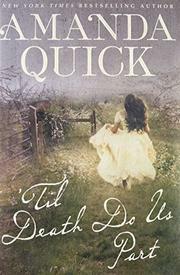 Quick’s appealing new direction somehow balances Gothic intensity and lighthearted wit.